The Filipinos should be proud of having the longest-running noontime show in the country, Eat Bulaga from TAPE Inc. to have it's very first franchise show in Indonesia called "Eat Bulaga Indonesia" with premiere on Monday, 16 July at 4pm via Surya Citra Televisi (SCTV). In over 33 years, Eat Bulaga reign supreme in Filipinos' heart. Dabarkads as the main hosts are called, became an icon in the noontime in the Philippines. 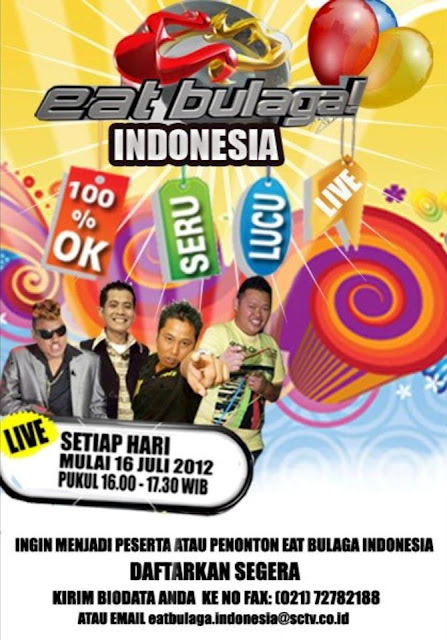 Indonesia will do experience the same as Eat Bulaga franchise premiered. EB Philippines is being broadcasted from The New TAPE Studios (Eastside Studio) at the GMA Broadway Centrum in New Manila, Quezon City. Eat Bulaga! is aired Weekdays and Saturdays at 12:00 pm to 2:30 pm (PHT). The show is also broadcast worldwide through GMA Pinoy TV. Eat Bulaga Indonesia has production at SCTV Studio 9 with running time of Mondays to Fridays at 2:30 to 4:00pm and Saturdays at 2:30 to 5:00pm. According to SCTV, the reason for the franchise of original noontime show of the Philippines is it's theme about happiness, caring for nature and helping for each other . The fourteen hosts of EB -Uya kuya, Aja Farid, Reza No, Ramzi, Narji, Ciripa, Rian Ibram, Rio Indrawan, Steven, Leo Consul, Selena Alexandria, Jenny Tan, Bianca Lizza and Julie Christie wish the luck for the new program. The Indonesian TV station describes its new show as "definitely fun and contains a lot of funny games that are positive, touching, and surely exciting." Popular segments of Eat Bulaga will be catered like Bulagaan (Bolagaan), Karaoke Games, Juan For All, All For Juan (Satu Untuk Semua, Semua Untuk Satu) and the most popular Pinoy Hento(Indonesia Jenius). This is another milestone in Philippine entertainment industry as the concept is being showcased in other country. Eat Bulaga premiers at 1979 on RPN channel 9 in the Philippines (now SolarTV channel) in tight competition with revived Student canteen on RBS network or GMA network, which it eventually win on the ratings. Eat Bulaga! (Bulaga means "surprise" in Tagalog, although it should not be taken literally) is a local noon-time variety show in the Philippines produced by the Television And Production Exponents Inc. (TAPE) of Malou Fagar and Tony Tuviera.